This is the ideal instructional text for first-time winemakers. Use it as your detailed guide this year to make high end red wine at home. Based on years of in-house research, hands-on winemaking and customer feedback, this booklet outlines our Best Practices and gives you the best shot at making great wine right in your home. Laid out in a direct and step-by-step fashion, this handy manual will be sure to stay by your side in your home winery for years to come. 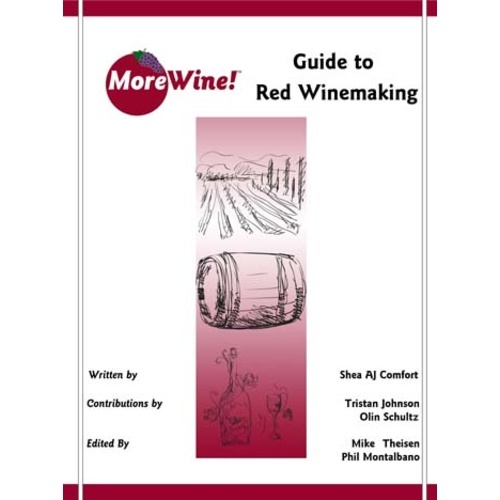 "I have been making red wine using the MoreManual Guide to Red Winemaking for three years. I originally downloaded a copy off of the website. Recently I bought the bound version because, of all the winemaking reference materials I have, including reference materials form a winemaking class and several books for home winemakers, the MoreManual is the only reference I bring with me to my home winery. When I need to make a decision, I consult that first. I appreciate the degree of thoroughness and detail in such a practical, hands on manual. If I can make good red wine using this manual, anybody can! It is far more useful to me than any of my home winemaking texts." Cuz it rocks. Very comprehensive. Excellent resource for me. Easy to understand and very detailed information. Cannot do without.